This article was first published in March 2015. There is a consistent pattern. NATO member states including Turkey, France, Britain as well as NATO partner countries (Israel, Saudi Arabia, Qatar) have been involved in the recruitment and training of ISIS terrorists. Canada is no exception. 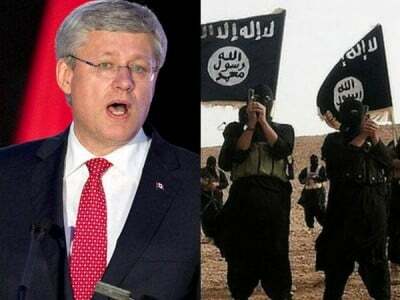 The latest bombshell revelation pertains to the alleged uncover role of Canada and its intelligence services in the recruitment of ISIS mercenaries. Should the allegations prove true, Dewar [spokesperson for the NDP] said there should be an immediate investigation into what happened, including how CSIS [Canada’s intelligence agency] would have recruited such a person to work for it. It is worth noting that Canada’s Ambassador to Jordan Bruno Saccomani is not a “run of the mill” career Canada Foreign Services official. Ambassador Saccomani was previously a Superintendent at the Royal Canadian Mounted Police (RCMP) before becoming Harper’s “security boss” in charge of the Prime Minister’s “security detail”. During his tenure with the RCMP and the Prime Minister’s office, Saccomani worked in close liaison with Canadian intelligence (CSIS). [Dewar said] … the reports say Rashid was recruited out of Canada’s embassy in Jordan, which is headed by [Ambassador] Saccomani. He said it is ironic given the government defended Saccomani’s lack of diplomatic experience by touting his background in security issues when the prime minister appointed him to the post last year. In particular, Canada has remained largely silent while other Western countries are criticizing Turkey for not doing more to stop the flow of foreign fighters into Syria, many of whom have joined Islamic State (ISIL). [Facilitated by Rachid, who was recruited out of Canada’s embassy in Amman] Shamima Begum, 15, Amira Abase, 15, and Kadiza Sultana, 16, are the three British girls believed to have joined the Islamic State, after they left their London homes in early February, travelled to Turkey and crossed the border into Syria. Turkish Foreign Minister Mevlut Cavusoglu has said the suspect arrested worked for the intelligence agency of a country that is part of the U.S.-led coalition fighting the Islamic State. He didn’t identify the country, but multiple media outlets, citing security officials, first reported Thursday the individual was working for Canadian security intelligence. CSIS may well be operating in the region. The role of Canadian intelligence (CSIS) allegedly operating out of the Canadian embassy in Amman in the smuggling of the three British girls into Syria to join the Islamic State is but the tip of the iceberg in the ongoing process of US-NATO sponsored recruitment and financing of terrorists. Also discussed in Brussels [NATO headquarters] and Ankara, our sources report, is a campaign to enlist thousands of Muslim volunteers in Middle East countries and the Muslim world to fight alongside the Syrian rebels. The Turkish army would house these volunteers, train them and secure their passage into Syria. …. Under British law, H.M.’s government has the obligation to protect and come to the rescue of British citizens travelling overseas, whose lives and security are threatened. In this case, we are dealing with a criminal act namely the smuggling of British teenage minors (allegedly facilitated with the support of CSIS) into the hands of a terrorist organization (ISIS), which just so happens to be supported covertly by US-NATO (including H.M.’s government). The British authorities have largely dismissed the matter. Prime Minister David Cameron says that it is for families to act, rather than the government. In all likelihood, MI6 was in contact with CSIS, its Canadian counterpart.